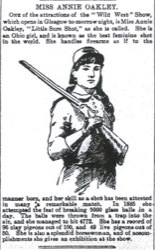 ONE of the attractions of the "Wild West" Show, which opens in Glasgow to-morrow night, is Miss Annie Oakley, "Little Sure Shot," as she is called. She is an Ohio girl, and is known as the best feminine shot in the world. 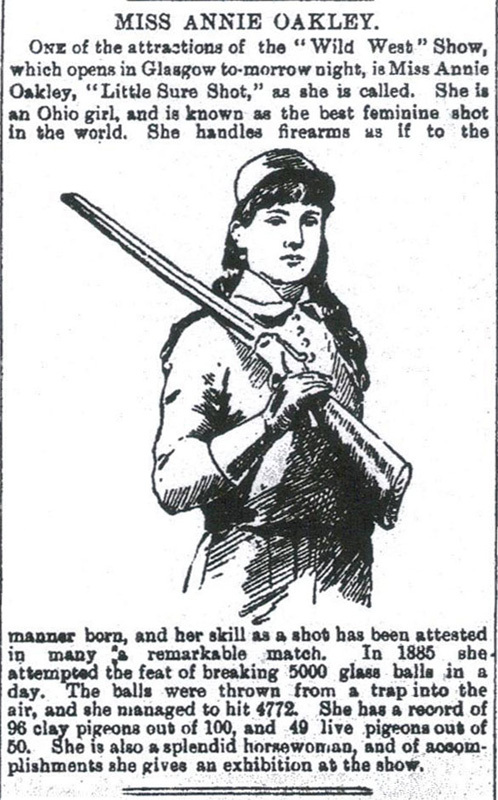 She handles firearms as if to the [illustration] manner born, and her skill as a shot has been attested in many a remarkable match. In 1885 she attempted the feat of breaking 5000 glass balls in a day. The balls were thrown from a trap into the air, and she managed to hit 4772. She has a record of 96 clay pigeons out of 100, and 49 live pigeons out of 50. She is also a splendid horsewoman, and of accomplishments she gives an exhibition at the show.